ASIA NEWS IT report: Attacks by anti-government militias intensify. Rockets and missiles mostly affect civilians, even children. Yesterday a market capital, crowded with people busy shopping for Mother's Day was hit. Witness: "terrifying" explosion. The evacuation of civilians from Ghouta east continues. Damascus (AsiaNews / Agencies) - At least 37 people are dead and 35 injured following an attack carried out yesterday by rebel and pro-jihadist groups fighting the Syrian government; the rockets, launched from Ghouta East under government army siege, hit a market in the Jaramana neighborhood, in the center of Damascus. In the last period, rebel groups fighting against the government have stepped up artillery and rocket attacks on central districts of the capital. The daily violence is perpetrated by militia in the silence of the media and Western governments, as pointed out in a stark letter of accusation by the Trappist nuns and confirmed by the apostolic nuncio Card. Mario Zenari. 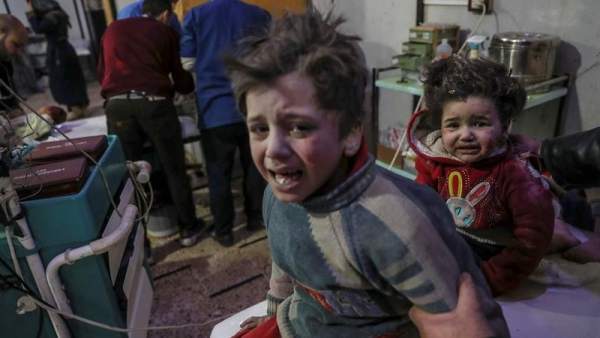 "The militia launched a rocket attack on the Kashkoum market in the Jaramana district of Damascus at 6.15 pm local time" yesterday, according to a spokesman for the Russian army, an ally of the Syrian government. "The toll [...] is at least 37 dead and 35 wounded". Yesterday’s was one of the most bloody attacks launched by rebel and jihadist groups from the Ghouta east region, on the eastern outskirts of Damascus, towards the capital. Rockets and missiles which, in the great majority of cases, hit homes, hospitals, schools and cause civilian casualties, even among children. The market targeted in yesterday's attack was packed with people, many of whom were busy shopping for Mother's Day. A taxi driver, speaking on condition of anonymity, reports that the area is famous among the inhabitants of the capital for cheap clothes and groceries. A 30-year-old nurse adds that a rocket hit a commercial area that is "next to a security checkpoint". The intensity of the explosion, the nurse added, "was terrifying". Meanwhile, the government army and its allies have reconquered over 80 of the territories that make up Ghouta East; the area still in the hands of the rebels is divided into three pockets, each of them under the control of a different faction. The UN agencies operating in the area are sounding an alarm for the "massive movement of civilians" under way. Tens of thousands have left the area in recent weeks following the opening, albeit partial, of humanitarian corridors; many of these people are in poor health, malnourished children, those suffering from scabies, dysentery and respiratory infections.